TUSCON -- Debbie Scheidemantel got to know Jared Loughner when he was a student in her biology class at Tucson's Pima Community College last summer. 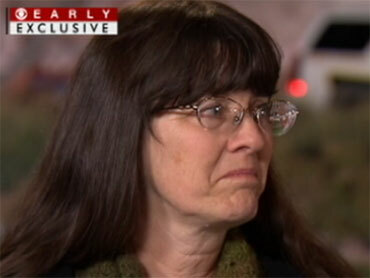 The adjunct professor says she once had to call police and have Loughner removed from her class. Scheidemantel shared her story exclusively on "The Early Show" with co-anchor Erica Hill. Scheidemantel said on September 23, Loughner was "very destructive" in class. "Students understand this," Scheidemantel said. "But he didn't seem to, and he pointed at the flag, and the Constitution up at the front of the room and said that I was taking away his freedom of speech, I was taking away his individual rights, that it was unconstitutional. He was saying that, you know, he's paying me, and therefore I'm taking away his freedom of speech if I don't give him full credit. Well, I did calm him down. And I told him, you know, at that point, we couldn't resolve it real quick, so I said, you know, talk to me at the break. And he seemed to calm down. And class started." But Loughner's disruptive behavior, Scheidemantel said, didn't end there. "Class started and, five minutes later, he raised his hand. I guess he got the idea. He asked, 'Could I go to the library and do the assignment and come back before class is over and turn it in for full credit?' And I said, 'No, that it would be half-credit, because it was due at the beginning.' And again, he started his rant about the Constitution, pointing to the flag, pointing to the Constitution up at the front of the room, and at that point, he wouldn't stop, so I asked the students to be calm and wait, and at that point I went to the next room, and alerted my lab staff that there was a situation, and I called 911." Hill asked, "Were you fearful for your safety or for the safety of your other students at that point? Did he seem that he was violent in any way?" Scheidemantel answered, "He was not violent in any way, and he did not threaten anyone directly. But I did feel uneasy. I know the students were feeling uneasy. And so we called 911, and two officers came out. They removed him from the room and talked to him for awhile, and then one of the officers came to talk to me." Scheidemantel said the school and police backed her up appropriately. "Pima, I have to commend them. Backed me up and was right there. One officer talked to him for about a half-hour outside the classroom, and I think they realized that he was not thinking rationally, and the other officer mentioned something about maybe special ed or whatever. I didn't know, I had no indication if just was in a special program or something like that." That was the last Scheidemantel heard of Loughner -- until Saturday. Hill said, "You're watching coverage of this event, and as I understand, you heard that the alleged shooter was 22, that's it -- just the age of the alleged shooter." Scheidemantel said, "His name and picture immediately came to my mind. And then they gave the name, and I recognized the name, of course, and a little bit later in the newscast, they were showing the YouTube videos, and especially the one that had the black background with the writing on it. As I was reading it on the TV, I recognized the syntax and the unique way of writing and the convoluted illogic logic that he used to make his points." Loughner, who's been described as a social outcast with wild beliefs steeped in mistrust, faces a federal court hearing Monday on charges he tried to assassinate Rep. Gabrielle Giffords of Arizona and killed others in the Tucson shooting rampage on Saturday.